Here is a short post about an eye look I wanted to share! It was just something really quick.. I was too tired to put on false lashes and mascara lol! Sorry for that! you can jsut imagine it would look a lot more dramatic with false lashes. I love this look.. it would look great for a night look but also be great as a day look if you replace the dark gray with a brown. 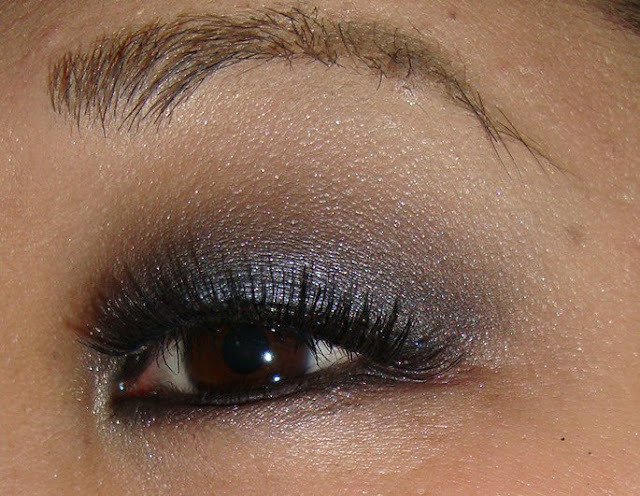 I used a random dark gray shadow and a Mac shadow in 'Fade' on the lid with a soft brown shadow in the crease. On my lashline I used Mac's Pigment shadow in 'Cornflower'. I hope you enjoyed this quick look!! Be sure to send me your requests for halloween looks or regular makeup looks! Because I'm not sure what to do and what color combos to put together since I am always wearing the same shadows. I do have a lot of nail looks coming up though! YAY! aww thank you!! I will check out your blog soon!